History has been taught at The Catholic University of America almost from its establishment in 1887. Befitting the origins of the University in clerical education, the earliest such courses were in church history, and were offered first in 1892. In 1904 the Department of History, established within the School of Philosophy, was first chaired by the Knights of Columbus Chair of American History, Charles Hallan McCarthy. In 1909 Marist Father Nicholas Weber began to offer courses in “general history.” Later, ancient history, medieval, early modern and modern European history, as well as the history of Latin America were also taught at CUA. Many well-known historians would soon come to teach history in the Department. The twentieth century saw some dramatic historical moments, and the University’s faculty and students were here participating in as well as witnessing world-changing events such as the First and Second World Wars. 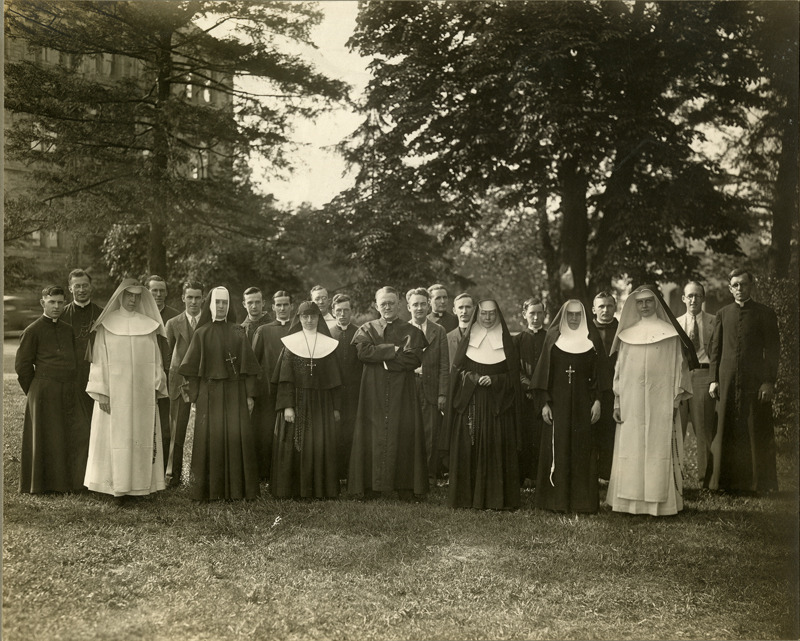 World War Two, in particular, required the service of many at CUA, significantly changing the character of the University: during the war hundreds of nurses and female religious came to campus for training, and the postwar years saw a huge influx of former soldiers to CUA on the GI Bill. Professors, too, were involved in the war. Edward Lilly, a history professor at CUA at the time, was the first historian to study U.S. war intelligence – tragically, Professor Lilly was never able to publish his detailed work because it was considered top-secret! At the same time, scholars who managed to escape Nazi terror in Europe began teaching history from new perspectives. In the 1960s and 1970s, CUA was equally affected by the drama of the social and political conflicts that shook Washington and the nation. History became a critical tool to understanding society for many; others wanted to preserve a more traditional idea of the study of the past. Even today, history courses, research topics, and the personalities of the faculty are reflective of political, social and cultural changes of our society and the world. The history of CUA’s department of history is a mirror of the past of an institution that has always profited from a fruitful tension between church and world, between priests and laymen. This story has not been told yet but this project seeks to tell it, in the process providing us with profound insights into the identity of the University, knowledge essential for its future. The American Catholic History Research Center and University Archives, together with the CUA Department of History invite researchers, students, alumni and anyone interested in the history of the Catholic University of America, to explore and study primary sources related to the history of teaching and studying history at CUA in the context of the twentieth century. Starting this year, student apprentices, faculty, and archivists have begun to compile, sort, publish, and analyze archival materials related to the department of history, its professors and students. This project is part of a new program of undergraduate apprenticeships in history (course HIST 493) in which students learn practical research, analytical, editorial and publication skills. Throughout this course, students will learn how to manage unexplored mines of “big data,” to hone research and writing skills, and in the process gain insights into how many generations have experienced life and learning on this campus.